TELSCO is located at 12750-127 Street in Edmonton. What are TELSCO’s Hour of Operation? Although TELSCO’s monitoring station is operating 24/7, our public access is Monday thru Friday; 8:00am – 4:30pm. Visit our friendly office staff to purchase a back up battery, pay an invoice, or arrange to have a tour of our building. If your insurance company requires a copy of your Installation Certificate to provide you with a discount we will be happy to provide one at your request. Contact our office staff at 780-424-6971 and we will forward a copy to you, or directly to your insurance company. How do I set up or update my Keyholder & Password Information? Additions or deletions to your account can be made by contacting our monitoring station by phone (780-424-6971) or email (station@telsco.com). Traditionally, alarm systems have been dependent on analog phone lines to communicate to the Central Monitoring Station. This mode of communication is being replaced by a cellular option. If you are looking to eliminate your land line, you will require a Cellular Communicator for your alarm system to communicate with the Central Station. Please contact our sales team at 780.424.6971 to find out about options for your system. Can I Control my Security System with an App? 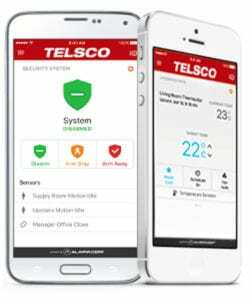 With TELSCO Connect, you can connect to, and control your Home or Business security system from anywhere using an App or Web Portal. Not only can you arm and disarm, but you can set up valuable notifications and even integrate with home automation. See this video for step by step instructions on changing your panel battery. Where can I purchase a back up battery? The back up battery for your alarm panel can be purchased directly from TELSCO or at a specialty battery retailer. See this video for step by step instructions on changing your wireless device batteries. Please ensure you contact our monitoring station prior to changing your device batteries, as they are equipped with a 24 hour tamper alarm. The lithium batteries used to power your wireless devices can be purchased at virtually any hardware store or battery retailer.